11 Commercial Real Estate & Properties in Mitchell are listed in 2 categories. We have 7 Industrial Warehouses Sale and 4 Retail ShopsSale . Mitchell is the newest of the industrial suburbs in Canberra and is experiencing solid growth. It services the north side of Canberra and growth is being driven by the ever expanding Gungahlin region. With major roads running through to Gungahlin this suburb will continue to have a large consumer base for years to come. Outstanding opportunity to purchase a new industrial property that is not only anchoraged by a well known national tenant, O'Brien Glass for 7 years, but also has two other tenancies which has new three year leases in place. Well worth considering! Mitchell is the newest and fastest growing of the three industrial areas in Canberra. Mitchell serves all of the north side of Canberra. It services much of the growing Gungahlin precinct and has a strong owner occupier base. Well located in busy Brookes Street, and offering excellent exposure, this unit offers a reception area, large workshop with roller door and plenty of on site parking. A rare opportunity in this price range. Mitchell is the newest and fastest growing of the three industrial areas in Canberra. Mitchell serves all of the north side of Canberra. 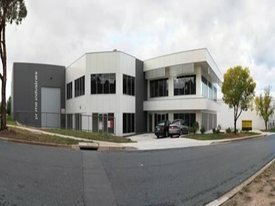 It services much of the growing Gungahlin residential and commercial precincts and has a strong owner occupier base with Flemington Road home to some of Mitchell's newest developments. A 2997 m2 site that will be shortly developed,having a double street frontage from Flemington Road and Darling st. The front showroom will have a area of 966 m2. It is designed for 3 units also being 268,288 and 410 m2 of showroom space. The lower gound floor cab be workshops /storage or also showrooms fronting Darling st. The whole area is 943m2 with the area also being avaialble if required from 232 m2 upwards. 57 Carparks are on site. The building will be completed August 2013. Mitchell is the fastest growing of the three industrial areas in Canberra. Mitchell serves all of the north side of Canberra. It services much of the growing Gungahlin precinct and has a strong owner occupier base. Located just off Hoskins Street amongst the newest developments in Mitchell, this outstanding warehouse has been divided into three separate tenancies. Two of the tenancies have new 3 year leases in place and are currently returning $105,968 p.a. while the third tenancy of 507sqm is currently vacant and ideally suited for an owner occupier. This unit offers 6 metre clearance, high bay lighting, toilet/kitchen facilities and the potential to have a secured yard if required. Mitchell is the fastest growing of the three industrial areas in Canberra. Mitchell serves all of the north side of Canberra. It services much of the growing Gungahlin precinct and has a strong owner occupier base. Well appointed ground floor unit with quality showroom/reception area, large kitchen/breakout, with large storage area to the rear that can also be accessed by a roller door. Showroom and workshop accommodation.There are 3 shopfront entries, allowing for sub division. A rear roller door to Unit 2, leading into a large common service yard having access from Grimwade St. Prime signage on a corner location.Common area carparking. Showroom and workshop accommodation fronting Sandford Street with a rear roller door leading into a large common service yard having access from Grimwade St. Prime signage on a busy street.Common area carparking. Prime corner location on the corner of Grimwade, Sandford Streets and Kemble Court. Sandford Street links Gungahlin Drive and Flemington Road. Highly desirable passing traffic, with the strata units offering high exposure. Prime showroom with 2 shopfront entrances, allowing for sub division. Large common service yard having access from Grimwade St. Prime signage on a corner location.Common area carparking. Prime corner location on the corner of Grimwade, Sandford Streets and Kemble Court. Highly desirable passing traffic, with the strata units offering high exposure. A ground floor unit with Kemble Court frontage. Showroom. Toilet and shower amenities. Rear roller door leading to a common service courtyard. Wall mounted air conditioning unit. Prime corner location on the corner of Grimwade, Sandford Streets and Kemble Court. Sandford Street links Gungahlin Drive and Flemington Road. Highly desirable passing traffic, with the strata units offering high exposure. Showroom and workshop accommodation.There are 3 shopfront entries, allowing for sub division. A rear roller door to Unit 2, leading into a large common service yard having access from Grimwade St. Prime signage on a corner location.Common area carparking.